A (former?) Twizy and current Zoe driver in Austria called “AbRiNgOi” had a Twizplay laying around. 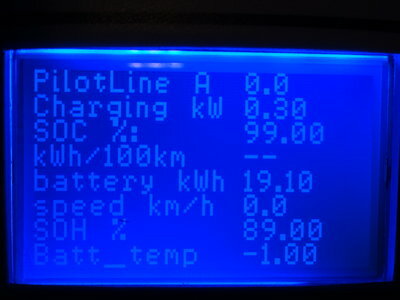 This is an open source CANbus driven small display, based on Atmel micro controller. Anyone who has ever played with Arduinos knows what I am talking about. The specific controller used is an automotive version of an ATmega with a build in CAN controller. He reprogrammed the Twizplay using the CANbus information that we gathered and that is available in the source code of CanZE on github. We are very pleased and proud that our hard work is spinning off toward other projects, in the true spirit of Open Source. Link here. TwizPlay is originally programmed in BASCOM (a non-Free BASIC compiler for the Atmel and 8051 processors), but “AbRiNgOi” decided to do this the proper, but hard way and redo all using Atmel Studio 7 and C++, bringing it much, much closer to the Arduino community.